“La La Land” came to the Toronto International Film Festival” on Monday as something of a known quantity, but that put extra pressure on director Damien Chazelle‘s musical starring Ryan Gosling and Emma Stone. The film’s first and second impressions, which came at the Venice and Telluride Film Festivals, respectively, resulted in rave reviews and awards predictions. And in the aftermath of those festivals, the film wound up on top of most Oscar prediction charts, making the stakes high for its TIFF debut. At the Princess of Wales Theatre Monday evening, an audience clearly primed to love the film did just that. They cheered for the massive opening song-and-dance number set on a crowded Los Angeles freeway overpass. They cheered the witty duet in which Gosling and Stone promise they’re not right for each other. (It’s no spoiler to reveal that they change their minds.) They cheered the scene in which Stone’s character, an aspiring actress, turns an audition into a dramatic ballad. And they gave the cast and crew a lengthy standing ovation when it ended. So yes, “La La Land” has a shot at the big prize, thanks to the same kind of sentiment that propelled “Birdman” two years ago — the acknowledgment that it’s not just a satisfying film, but an ambitious and maybe even crazy accomplishment. Chazelle has opted to make an original musical in which people spontaneously break into song in 2016, when musicals are OK mostly if they’re animated (“Frozen”) or based around singing competitions (the “Pitch Perfect” series). This is hardly a slam-dunk with Oscar voters, who gave acting awards to “Les Miserables” and “Dreamgirls” but haven’t given the top prize to an original musical since “Gigi” in 1958, or to any musical since the Broadway adaptation “Chicago” won in 2002. But “La La Land” is something special, a lovely and touching concoction that simultaneously embraces the dazzling form of old Hollywood musicals while simultaneously admitting that musical fantasies are sort of a con. “I wanted to do a musical, but really ground it in real life and invest it with stuff that felt a little messier and more real,” said Chazelle in a Q&A following Monday’s premiere. 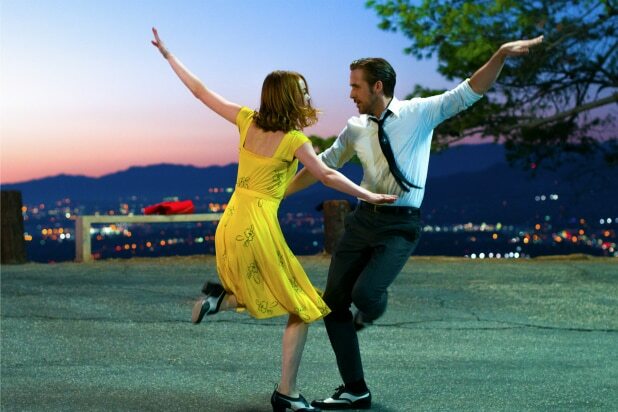 It isn’t easy to take a genre whose whole premise is that magical things can happen with a story that says they don’t — and on first viewing (there will be more), “La La Land” has stretches that slow down before it soars back into the heights. But it’s bold and beautiful and sort of nuts. Stone is dazzling and Gosling pulls off the neat trick of being persuasive in a musical even though he’s not a particularly strong singer. As it did in Venice and Telluride, “La La Land” came to another festival with high hopes and walked away with those hopes intact. It’s in the race to stay.